The Tacx Ironman is the official ‘Cycle-Mounting Trainer’ for the world famous Ironman competition. It's performance and durability is perfectly suited to those wanting an extreme workout, just like the triathletes that compete in this competition. Basically, the Ironman trainer is exactly the same as the impressive Tacx i-Genius turbo trainer except that it is branded specially for the Ironman competition and it comes with a special film (that you ride on) of the Ironman World Championship bike course in Hawaii. You also get a Kona water bottle that you do not with the i-Genius. The trainer has a high-end motor braking unit that controls the resistance to the back wheel of your bike. Motor brakes are at the cutting edge and Tacx is one of the only companies to offer it. 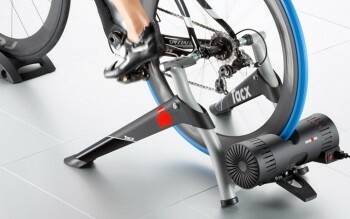 The main advantage of the motor brake over other types of resistance units on turbo trainers is that it can not only offer resistance to your back wheel but it can also power (drive) it, meaning when you are cycling on real road routes (whether using the Tacx films or the Tacx virtual reality courses) you get the best and more realistic experience you can. So if you are on a decline you will feel like you are on a decline because you back wheel is physically spun by the trainer. 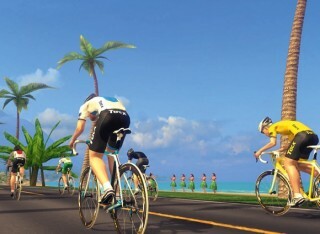 The Ironman bike trainer comes with the Tacx Trainer Software 4 Advanced, which lots of virtual reality terrains that look absolutely amazing. It is like you are cycling on these famous routes from your home. Also there are many films of world famous racing routes that you can ride, and as mentioned the resistance of your trainer is automatically synced to the incline/decline of the route. The faster you ride the quicker the film goes.